Based on sales at independent bookstores nationwide for the eight-week period ending May 12, 2009 (including National Poetry Month). This has been a banner week for the IndieBound application for iPhone. It's now at #2 in iTunes Free Book Apps list, and was recently featured on the front page of the iTunes App Store, viewable both in the iTunes program and in the iPhone's native App Store. Marc Fitten, author of the new novel Valeria's Last Stand (Bloomsbury), is "spicing up" his U.S. book tour by visiting 100 independent bookstores along the way. Fifty of independent booksellers' favorite authors will be at this year's ABA Celebration of Bookselling Luncheon at BookExpo America. The Friday, May 29, event, open exclusively to the owners and staff at ABA member stores, will feature the presentation of the inaugural Indies Choice Book Awards (ICBA). 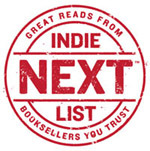 Here's a full preview of the Indie Next Spring/Summer '09 Reading Group List, which ABA member stores in the IndieBound movement will be receiving in the May Red Box. After more than four weeks of voting by booksellers at independent bookstores across the country, the American Booksellers Association today announces the first three inductees to the Indies Choice Book Awards Picture Book Hall of Fame. Reaction to the IndieBound application for iPhone and iPod Touch, released Monday, has been overwhelming, with hundreds of downloads and many positive reviews. For the eight-week period ending April 21, 2009, and based on sales at independent bookstores nationwide. With the launch of the IndieBound app for iPhone on Monday, April 20, independent booksellers are boldly going where they've never gone before: the rapidly growing realm of mobile applications. Announcing the 2009 Indies Choice Book Award Winners! The American Booksellers Association today announces the winners of the inaugural Indies Choice Book Awards. Formerly the Book Sense Book of the Year Awards, the new Indies Choice Book Awards reflect the spirit of independent bookstores nationwide through new categories and a broader range of winners and honor books. The IndieBound.org Affiliate Program is unique in that it links to not one, but hundreds of independent bookstore websites. And this week the program, which pays generous commissions to bloggers, authors, and other website owners on sales their sites refer to independent bookstores, launched the first of several planned enhancements. Whether it's for Mother's Day, Father's Day, graduation, or just to celebrate the sunshine and fresh air, spring is a great time to send a greeting to a loved one. For the eight-week period ending April 7, 2009, and based on sales at independent bookstores throughout the U.S.